I occasionally get requests for this and although they exist in Guate, you probably don’t want it. A well processed natural calls for slightly drier climate or a controlled mechanical drying. As we dry everything on the patio we need to get lucky with a solid week of exceptionally strong sun to handle this. There are still 2 greater reasons why not to buy naturals from Guate. 2. If you dried it adequately and gave it good drymilling/processing that yielded a nice “looking” bean it probably still tastes fermented and or grainy and grassy. Why? The only naturals I’ve ever seen are the result of sifting off the floaters in the first water tank before depulping and some of this is nice because it is a cherry that has only 1 bean in it, BUT IS NOT A PEABERRY. The other parchment/mucilage shell inside is hollow, thus it floats. However most floaters float because of other internal defect, or most likely it is simply overfermented and clearly appears it as the skin has already begun to shrivel and dry up like a raisin. This means although it maybe remains connected to the plant it is no longer in growth mode receiving nutrients, rather it is dying ON the tree. The other natural coffees found in Guate tend to be under ripes. Whether this was picked accidentally or on purpose, sorting them out is easy, and the taste is poor, so everyone ensures they’re not part of the “export” coffee. If you’re cup ever tastes like wheat grass… this is probably why. Wheat grass! That’s it. I’ve had some of that and couldn’t place it (not at FVH). Thanks for the informative post, friend. Anacafe would never let this out of the country, would they? Good post, though. No, not as photographed above. And ideally even if it gets the highest treatment of dry milling, they don’t want the guatemalan coffees name damaged. Anacafe does random sampling at ports before entry into secured area (instead of sampling EVERYTHING) to ensure this type of coffee doesn’t get out. They even do it with ours with despite the fact that they say it is to protect the buyer knowing that when we export, I’m both the exporter/seller and the importer/buyer. Very interesting post Edwin. How about pulped naturals? 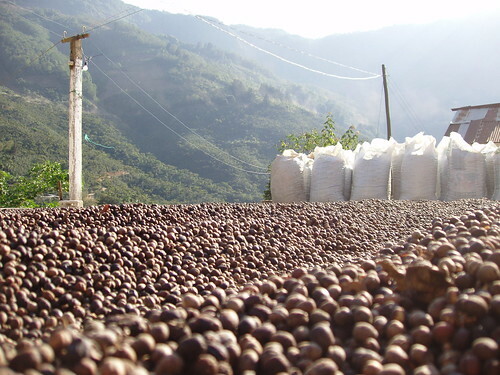 Do you think it would be possible to produce a clean, sweet, full-bodied Guatemalan, if you pick, sort and pulp the coffees as meticulously as you do with the washed, and then dried them evenly after pulping? Or is the climate too moist? Are there other problems you might encounter. I should say straight away that I’m not asking because I’m looking for that type of processing. I’m much more fond of the washed coffees in general, but I’m just curious about which complications you might see. Klaus – it certainly is possible. You are correct about the humidity – this is a BIG reason why it is not a common commercial practice to dry natural in Guate. Conditions good for drying naturals will dry washed coffees too fast and their final moisture content ends up less consistent. Naturals are often so wild and unpredictable b/c the varying size between skin and seed (that makes up the fruit to be fermented off) will react differently to the same amount of natural or mechanical heat. In the end it’s often visible to the eye while looking at just a hand full of green.